IPL 2019: At the time of filing the copy, CSK was 99/4 in 14 overs. 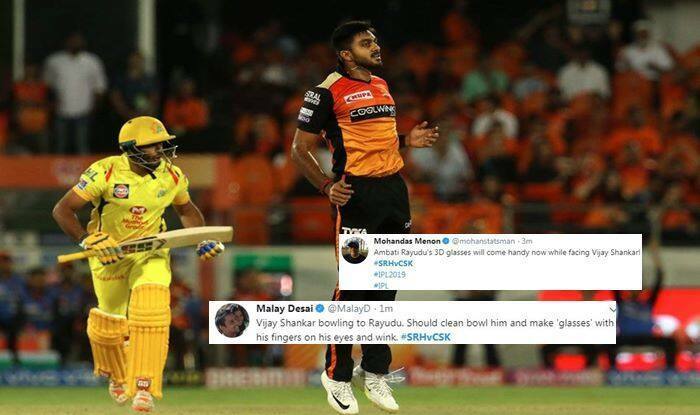 IPL 2019, SRH v CSK: Ambati Rayudu nearly chopped the first ball onto his stumps off Vijay Shankar. Rayudu vs Shankar is the battle to watch out for after the latter pipped the former to make it to the World Cup 2019 squad. It was a toss-up for the No 4 spot and Shankar had the last laugh. The fans on Twitter went abuzz when Shankar was bowling to Rayudu. Rayudu had taken to Twitter after the WC snub and spoken about ‘3D’ glasses while taking a cheeky dig at the selectors.